This is an alternate build for LEGO Creator Mini Skyflyer 31001 . I love these small LEGO Creator sets. They typically have 50 to 100 pieces and have instructions for three separate models. I will try to get a review of this set and it MOCs at Rebickable posted soon. 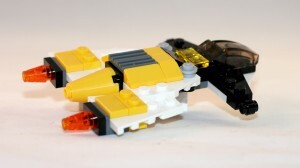 I have created some instructions in case anyone wants to make their own LEGO Galactic Cruiser. Missing any pieces to complete this build? Buy spares at . Tagged Downloadable Instructions, MOC. Bookmark the permalink. Huckleberry Brick | Powered by Mantra & WordPress.